Aadhi Bhagavan underwent a recent title change to Ameerin Aadhi Bhagavan after Hindu religious organizations raised objection to the earlier title. 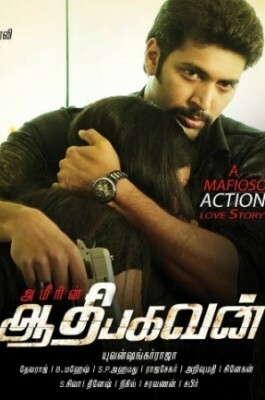 A mafia based thriller, Aadhi Bhagavan has Jayam Ravi, Neetu Chandra and Babu Antony playing significant roles. Reviews have not been exactly kind to Aadhi Bhagavan so the collections are far from satisfactory. The opening is termed average. Ravi proves his mettle by carrying off such a heavyweight action movie on his shoulders. This page hosts the Chennai box office collection of movies. It also includes movie analysis, trade analysis and public reaction to the movie. People looking for current top ten movies, Chennai box office, movies online, movie reviews, movie analysis, public response for a movie, will find this page useful. Ameerin Aadhi Bhagavan box office collection.